I’m a little late with the recap of my first bikini competition, but I’m finally back to share the story! Since this was my first competition, everything was new and I learned a lot in a few short days. I’ll start by saying I really enjoyed my experience as a whole! The competition itself had its ups-and-downs, but I’m already planning for next year. I decided to take vacation the day before the show. As much as I had wanted to save the extra day, I think this was a smart idea for my first competition. Immediately after waking up, I had Kirk take progress photos (in my competition bikini) to send to my trainer. Ashley used these photos to plan my meals for the day, which included a LOT of white fish. Including breakfast. Yuck. Laura played the part of the fish chef all weekend – she made two big pans of fish for us on Friday alone. The goal is to put enough on the fish that it tastes a little different. It kind of helps. White fish, sweet potato, and asparagus. 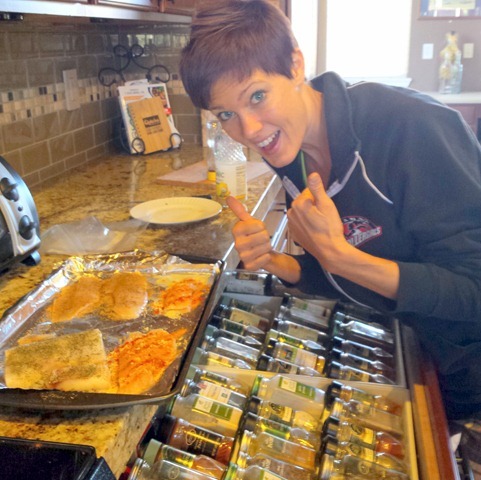 I have no idea how people eat this way for more than one week at a time – I would go crazy! At least I never got tired of sweet potatoes, they are sweet enough to pass for a treat any time. I also did my own nails for this show. A friend of mine from work recommended these nails you can pick up at Target – instant french manicure. These are so much better than those “press-on” nails I remember from when I was a kid, they really turned out great! I think the total cost for both as only around $20, which is much cheaper than a mani-pedi. After breakfast (tilapia smothered in cinnamon, mixed into sweet potatoes), we all walked to Starbucks for some fresh air. I love this Friday morning tradition! Even better when you don’t have to rush to get to work. I spent the rest of the morning relaxing and enjoying my day off, before taking my last shower before the show. A smelly truth I hadn’t known about before is you can’t shower OR put on deodorant after your competition tan (which is always the day before the show). Since my appointment was at 12:15 on Friday, that meant more than 24 hours between showers…without deodorant. We are not a rosy-smelling bunch backstage! On the bright side, the tan was actually pretty good! I expected oompa-loompa orange (what I see at most shows), but instead I was just a dark bronze (with an orange tinge). Not bad at all! And it washed almost completely off in the first shower. Pretty impressive work from Elite Tan! The rest of the day I just did my best to stay off my feet, stay cool and dry, eat on time, and not think too much about the competition. We headed down to registration a little before 5:30PM, leaving Kirk with our dinner requests for when we returned. As usual, Kirk was the best help as he offered to make both Laura & my dinner, so it would be waiting for us when we got home. Here’s when the weekend started to get a little rough. The event registration was held in a hotel conference room. Outside the doors, there was a table to purchase NPC cards (if needed). I bought mine and we headed into the main room. We started in the first of three lines, where we showed our NPC cards and confirmed the categories we registered for. The second line was to confirm our height class and bottom coverage (for bikini girls, they make sure you have 50% coverage on your glutes). This went pretty fast and I measured in at 5’1” – giving me class A for both Novice & Open. The third line was where the strange started. This was a long line snaking around the conference room – not moving much. Laura & I ate our last last white fish meal (yay!) in line and chatted with some other girls around us. After about 45 minutes and not much movement, Laura had to skip out of line to make her tanning appointment. When she came back, we were STILL in line with a ways to go. It seems that after we got in line, someone had started a second line on the other side of the room funneling to the same place. After around 2 hours, we finally got to the front of this line, where they found the registration paper we confirmed from the first line, checked it off in a computer, and then handed out a swag bag. What? I am not sure the purpose of that last line, but from my perspective there must have been a more efficient option. And the swag bag only contained a few supplement samples and a water bottle. No t-shirt (which I understand they have had in the past). At this point, the athlete meeting was far overdue and many competitors were past their final meal time (including Laura & I). The athlete meeting finally started an hour late, by which point most were hungry & tired. After the athlete meeting, they still had to finish up some computer work before being able to hand out everyone’s numbers. I’m still confused why these weren’t handed out at table 3 when they checked our names against the computer. That would have saved a lot of time from everyone’s evening. The worst part to me is that there was never an apology. Things happen, mistakes happen, but I expect the organizers to realize when that’s happening and to acknowledge the mistake. An apology for the confusion, for not having enough staff/volunteers to facilitate registration, to apologize for everyone having to stand around for an extra 2 hours the night before the competition, something! Unfortunately, that wasn’t the case. 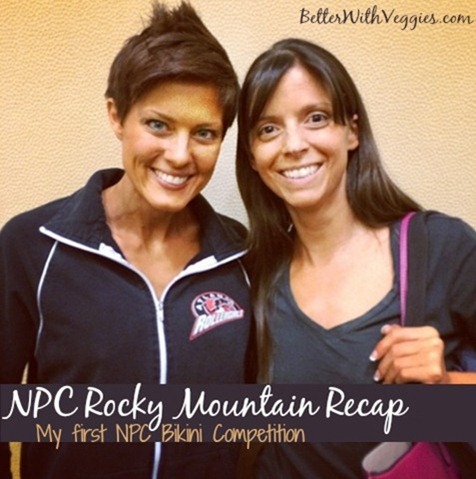 I heard excuses that this was the largest NPC competition ever in Colorado (which is cool! ), but no apology for not being prepared for these numbers. Honestly, they should have capped registration at whatever number of competitors they were staffed to handle. When we finally got home for dinner around 11PM and it was delicious! Grilled salmon on french bread with non-dairy butter. After eating the same thing for the last week, it was the best sandwich I had ever had. I was more than a little jealous of Laura’s glass of wine, though. By the way, you may have seen that I spent a few hours in the hospital this weekend on Saturday night. I ended up with gastritus, which was a miserably painful stomach cramping – it felt worse than food poisoning. From a CT scan, they said my intestine twisted at some point, but then fixed itself. I was given an otherwise clean bill of health, so our best guess is all the unhealthy food I ate last week at the conference aggravated my tummy after such clean eating before that. 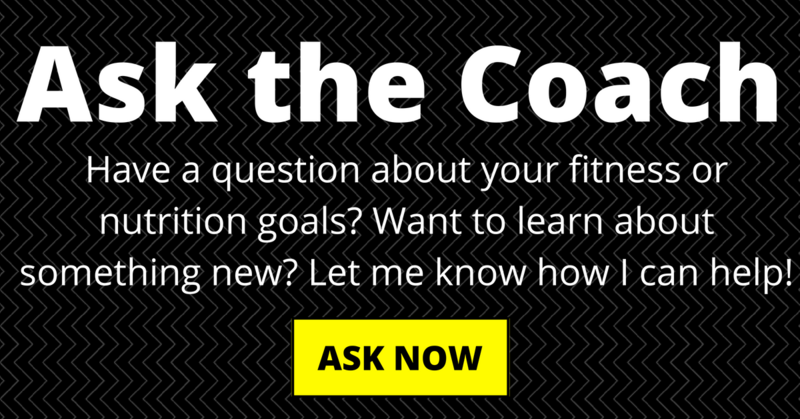 I knew better and my trainer gave me a good nutrition plan, but I just didn’t follow it. I learned my lesson for next time (assuming that was the cause). For those who have competed in the past – what is your typical registration experience? 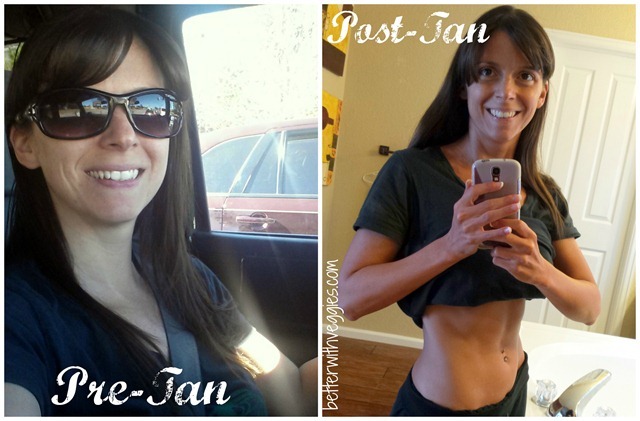 Have you ever gotten a spray tan? I think I had tried this once before in high school. Do you make time for pampering (mani/pedi) on a regular basis? I get massages monthly – that’s my style of pampering.